I finished my 3rd Quilt! I must say, quilting is a little addicting. I will have to slow down, because I am neglecting my "regular" household projects. This quilt was a lot of fun. I had no plan in the beginning, it evolved as I went. Step one was to purchase two Terrain Charm Packs as an add on an online fabric order I made. When I received them I immediately cut out 2.5" unique squares for my hexagon charm quilt. Then I put the rest away. One day, while procrastinating on another project, I pulled them out to play with. I laid them out different ways and finally started to sew them together. I sewed them into a square. I still had no idea where this project was heading, again, I put them away. 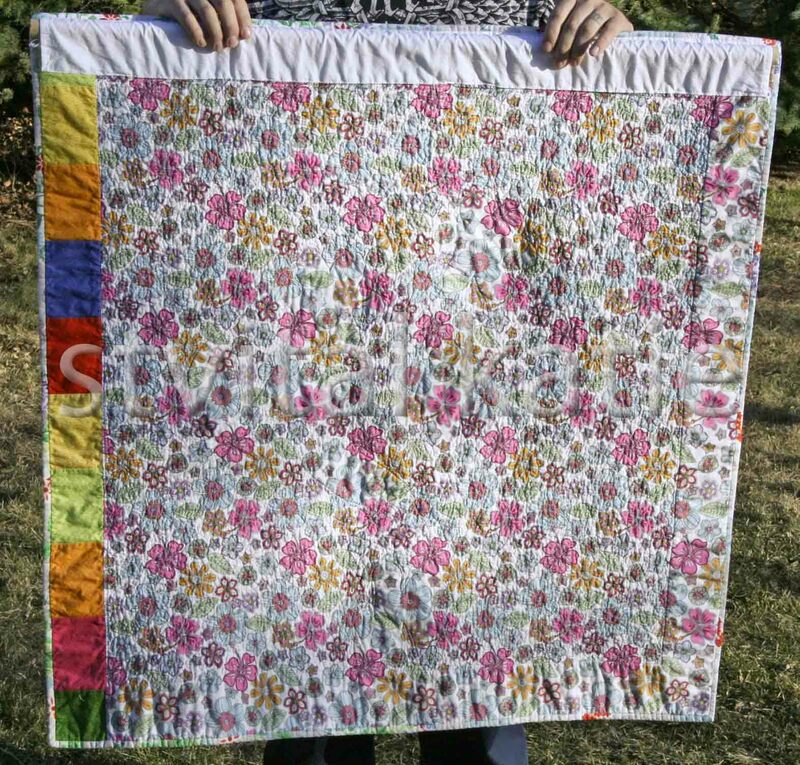 At this time I started to dream about what this quilt would become. Finally, I decided it had to be daisies. That is my flower after all. I thought the big white petals would be a great contrast on the colourful background. Still, I knew this would not be enough. 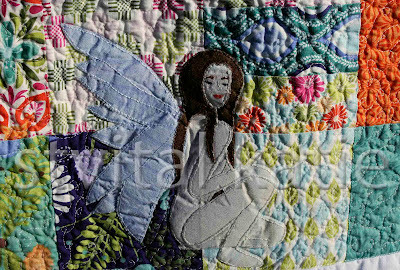 Then I realized it would have to be a fairy. Fairies, are playful, beautiful and whimsical. All things that worked well with this fabric. 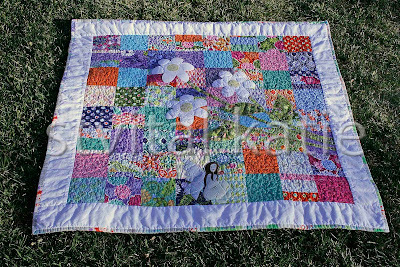 I framed it in white and used fabric from Kate Spain's Good Fortune line for the binding. I found the perfect piece of fabric in my stash for the back. I bought it on clearance for $2 about 6 months ago. Unfortunately, it was a little too small, so I added a colourful bar code to finish it off. 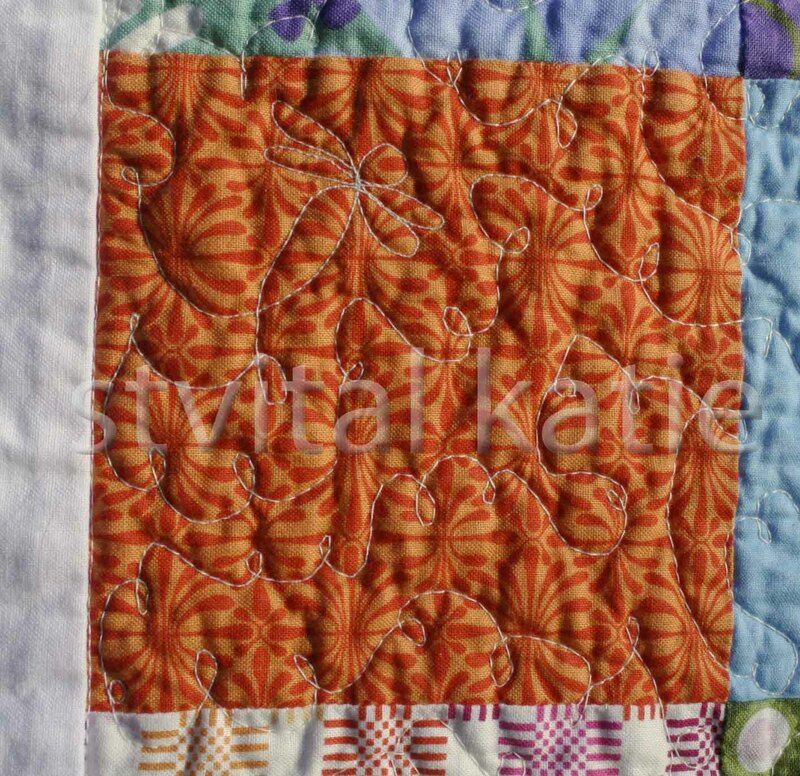 Finally, I quilted it with loops and dragon flies. I am glad I used such vibrant colours because the location I have chosen to hang it is a little dark. Below is a picture of the wall it is hung on. The left is the actual quilt and the right is the mirror image, which is what you see when you sit on the sofa in my living room. I hope you enjoyed it. 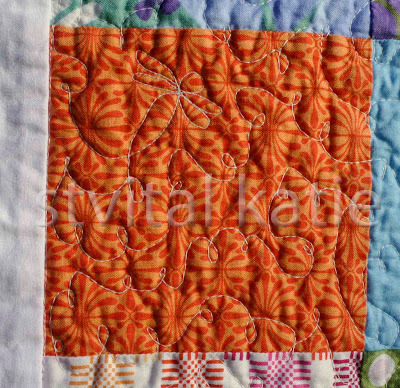 I am linking up with freshly pieced, Work in Progress Wednesday. Hexagon Charm Quilt: I have been making progress on this one. 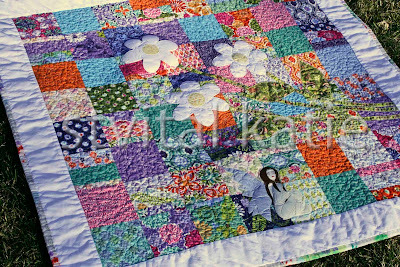 This is my fun no pressure quilt and I am enjoying every bit of it so far. I have 80% of my hexies made.